A veces necesitamos algo familiar. El sonido de una palabra reconocida, las vibraciones la risa de un amigo, la sensación de una besa de una amante. A veces Dios está muy cerca a nosotros. Para mí, en los días buenos, me siento Dios como el abrazo de una mama. Sometimes we need something unfamiliar. We need something to awaken us to the new and different possibilities before us.Sometimes God is in the places where we don’t expect beauty or love. For me, God can be in the way a plastic bag is blow up against a chain link fence. Sometimes God is in a foreign word I hear cooed over a tiny baby in the subway. Loose Threads are conversation starters for this community. This week let’s talk about home. Jenni: “Home, let me go home, home is wherever I’m with you…” Edward Sharpe and the Magnetic Zeroes, anyone? Great song if you haven’t heard it. Home is a hard concept, especially when you travel. I just moved to my new “home”, and it’s not home yet. I don’t know when the switch happens, but I’ve seen it before. You get a piece the first time you clean, and another when you invite someone over and there’s laughter or deep conversation involved. There are the days you are bone tired and can’t wait to get back to your bed, no matter how crappy it is, and that makes it a little more like home too. I used to miss home, and then became frustrated because I couldn’t figure out what city, or country for that matter, was home anymore. And while I haven’t totally figured it out yet, I think home right now means contentment. Knowing you are where you are supposed to be, accepting it, embracing it. It doesn’t matter if you can count five stars from your backyard or 500- if you can look up at the sky and feel content, then I think you have found at least a piece of home. Autumn: Home is a truth each of us writes in childhood; some write their truth from fact and others write their truth from fiction. This distinction is the only irrevocable human divide. Sophia makes herself present in my life to the extent that her name will appear on my college degree (a BA in philosophy). She weasels her way into my mundane moments, too, always asking me the hardest questions and leaving me hyper-focused on answering them, sometimes in a debilitating way. The way people talk to me sometimes, I wonder if she gets a particular kick out of poking at me while largely leaving others alone. While I’m personifying Sophia like the other writers here, it’s likely that I conceptualize her a bit differently. Having been an atheist since high school, my understanding of logos, of wisdom and truth, is not a Biblical one. But Sophia never left me when I renounced my belief in God. In fact, I think that’s when she found me. Setting the idea of God aside was liberating. It was as if my image of the world had been shrouded by information that had never really helped me, but of which I never felt free to let go. When I looked in the mirror and made that decision, I felt my mind running freer, my air clear and my floor swept. I was ready to consider anything. This blank slate left me to figure out what is objective and what is subjective in this world. What are our best tools for determining what’s real? If there’s no final word on morality, how can humankind ever move beyond debating about it? Where am I finding solace despite no guardian watching over me? Who among the fallible is worthy of being a role model? Will death hurt; will it be scary, or boring; will it be joyful? Or will it be none of these things? Many people tell me these kinds of questions scare them, but for some reason they never struck me that way. They’re like little puzzles, the handheld wooden kind that at first glance looks like it has a simple answer, but the more you stare and pull at it, the more vacuous it seems. Still, with little steps of progress come bouts of inspiration. Sophia reminds me of that when she gives me insight. Her hints keep me feeling and twisting, digging deeper. What I found is that science offers a wealth of information in response to these questions, more than it is usually given credit for. Sophia’s gift, when you develop a relationship with her, is that she never leaves you alone. She has all the audacity of a pioneer with the skeptical reservations of a scientist in the lab. When I picture her, I see a great, black void full of unfathomably large and complex things, glowing with vibrant colors and destructive characters. I see particles colliding and creatures decaying into new life, and I feel a tremendous balance, a safety in knowing that even if no one is watching out for me, even if I’m destined for hell, it’s all going to be okay. The cosmos will take care of itself, and we’ll all be okay. That I have the tools with which to learn about her infinitude and subtlety is reason enough to sit, be, smile, and embrace everything that makes this moment possible. That sense of calm validated by numbers is what gets me up every day. I want to share Sophia with everyone I can, including you, but I can only do that if you know you have to look for her. If you peer into dark corners and reach for her hand, she’ll take you to new places. It’s exhausting at times, but the reward is a kind of awe that, if I could describe it, wouldn’t be worth searching for. During my time in Kolkata, India I was able to visit the Mother House, where the Sisters of Charity carry on the work of Mother Teresa. The building itself is difficult to find, and unmarked except for a simple wooden door and a gold colored name plate on the side that reads Mother’s name. Two little boys had been sitting on the doorstep making paper airplanes as we waited for the door to be opened. I figured that happened when she was still around, too. I’ve heard Mother Teresa’s name my whole life. I’ve even read a few of her books, mostly simple sermons on loving the poor and the spiritually needy. But somehow I had missed this important piece. Basically, Mother Teresa wrote down her intense conversations with God, but she eventually reached a point where she could no longer feel him or hear him. She called this The Darkness, and Jesus was the Absent One. Reading that felt like a rock in my heart. I know it sounds silly, but I wish she had still been there so I could give her a hug and let her know she wasn’t alone. I’ve been in the darkness before. I have a feeling I’m not alone in that either, but I hardly expected company such as Mother Teresa. Doubt is not something to mess with. It’s hard, it’s hurtful, it’s painful and it’s the loneliest place on earth. I don’t have all the answers. Knowing one of the most famous Christian women on earth didn’t have all the answers either is simultaneously encouraging and scary as hell. But there’s something about faith. If you are in The Darkness, good. It’s a process and it may hurt more than anything else has ever hurt you before. But stick it out. Don’t give up. Keep questioning and searching and pulling and reaching and live a life of love, even when that love feels so far away. God is there. Maybe Mother Teresa couldn’t feel God for a while, but hearing the hymn of the other women who have given their lives to her and God’s work, he was there, he was multiplied, and the world was changed. If it comes down to a decision, faith or feeling, choose faith. I can’t promise anything, but I’m pretty sure you won’t regret it. 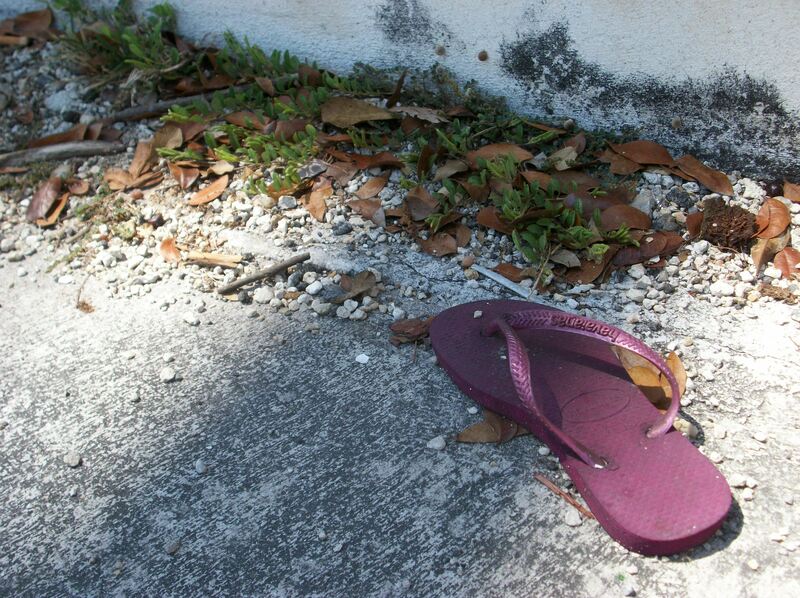 Walking along the sandy roads in Key West, I spotted a single child’s sandal laying abandoned along the side of the road. The day was warm and sunny and my mind instantly flashed to a sleepy child, worn from a day at the beach, losing the sandal as they were carried home by loving parents. The vulnerably of a child being carried contrasted with the strength of the one who is carrying them is a powerful image. Sometimes we are tired, and need to be carried. Sometimes we are strong and we carry someone else. These are acts of Divine Wisdom. Today’s guest post comes from Laura Beth Eschbacher, a freelance English teacher and translator living in Kleinbottwar, Germany. She was raised Roman Catholic (plaid skirts and all), but has grown to love the messy mysteries and complicated similarities between the world’s different doctrines. Her specialties include humor and honesty, both of which run wild in this post. So here is Laura Beth’s nutty post about finding God in funny places…. One particularly terrible day at the university, I was marching to class in the rain, brooding, eyes on the ground. I was feeling sorry for myself and cursing my latest failed romance when I suddenly felt the urge to stop walking and look up. No particular reason. My eyes immediately landed on a deranged-looking brown squirrel, hanging upside down on a tree trunk, legs sprawled. His eyes were fixed on me in suspicion, as if my presence had offended him. Then I burst out laughing. That squirrel and I had frozen at exactly the same moment. Why did I just have a mental show-down with a squirrel? And why did I suddenly think I could speak to it and be understood? Oh, you know. It was just the Soul of the Universe, poking fun at my drama with quick injection of sillyness. She had exposed the absurdity of my dark thoughts and brought me to judgment before an overgrown chipmunk. Naturally. I laughed the whole day. Once on the streets of Chicago, in the dark, all alone, I passed a women sitting on the street with her young child. I walked past her, and right behind me, a well-dressed women passed her as well. Then as if we both heard the same whisper of the Divine, we turned around at the same moment. We walked back to the women and her child. We shared our names. My work with house-less people taught me that many go weeks without hearing their own name. So I spoke this woman’s name, I spoke her son’s name. I let her speak my name. We named each other, three woman and one tiny boy on the streets of an unforgiving city. I wrote her name down many times, and although I have now forgotten it, it still burns fiercely in my notebook, in another Midwest town, while I again try to find the words for everything that passed between us. Though the well-dressed woman and I both had other places to be, we stayed on the street. Our new friend shared her story while shielding her small son from the chilly winds of the windy city. She told us her son never missed a day of kindergarten, but that his free school lunch was often his only meal. I gave her the food I had with me, and then the well-dressed woman asked the words I was about to speak, “Can we pray with you?”. We prayed, three women, three strangers in the middle of the sidewalk in downtown Chicago. Three powerful women harmonized an Amen, and it was clear that it was time for each of us to continue our own separate journeys. As I stood up and began to walk away, I looked back on the woman and child still sitting on the city sidewalk. The bible stories of my childhood swelled within me–a mother and child, no room at the inn, the last shall be first. For a brief moment, strangers had joined a mother and child, offered gifts and joined together in prayer. Angels, strangers, sisters, brothers, friends, enemies are all one in moments of prayer. When we prayed we became more than strangers, we became the living story of Jesus. Are prayer and meditation the same thing? Do you pray? Do you meditate? Smile with face, smile with mind, smile with liver. Now it is your turn…What do you think? While travelling through North India, my group and I stopped for breakfast on the side of the road. We were surrounded by mountains, and could watch the river beneath the drop off. Below the coffee shop, I sneaked a peek at a grandfather teaching his granddaughter how to walk. He saw me watching and looked up with a smile. I could see Sophia here in the shadow of the mountains, love being passed down the generations from his wrinkled hands to her baby fat ones. Age, place, language, culture and time did not matter here. Just family love, smiling up at me.